✴the Monastero della SS Trinità. This nunnery was founded in 1347 by Palma and Monaldesca, the daughters of Vanni di Monaldo Morganti, and a group of tertiary Franciscans. They were established under the protection of the canons of San Giovanni in Laterano, Rome: a number of nunneries established in the first half of the 14th century used devices like this to escape papal jurisdiction, which would have required strict enclosure. The community obtained oral approval of their way of life in 1373 from Pope Gregory XI, thanks to the intervention in Avignon of the influential prelate, Alphonse of Pecha. He also secured approval for the friars at eleven hermitages to adhere to the way of life promoted by the Blessed Paoluccio de' Trinci, and it seems likely that Paoluccio was associated with the sisters of SS Annunziata. According to Ludovico Jacobili, the Blessed Paoluccio de' Trinci founded this nunnery for a group of tertiary Franciscans in 1372, next to a hospice that belonged to the Confraternita della Trinità. They moved to the monastero della SS Annunziata in 1755, and their old nunnery was adapted to house the Reclusario Pio Pontifico (see Walk II), a house of correction for young people, in 1766. As noted above, the nunnery of SS Annunziata took on this new designation in 1755, following its merger with the Monastero della SS Trinità. The nuns commissioned a design for a new church from Carlo Murena. Construction began in 1760 on the site of an earlier church that had been dedicated as Santa Cecilia. The work was still incomplete in 1775, when the nuns called a halt, hoping that it would begin again at a better time, when they had more money. This better time had not arrived by 1860, when the nunnery was suppressed. The church was subsequently put to a number of secular uses. 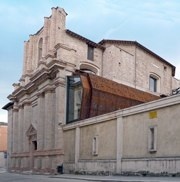 It emerged from restoration in 2011 and now houses a huge sculpture, “Calamita Cosmica” (1988) by Gino de Dominicis: this belongs to the Fondazione Cassa di Risparmio di Foligno and forms part of the collection of the Centro Italiano Arte Contemporanea di Foligno. This fresco was recorded in an aedicule above the entrance to the nunnery in 1866, with an attribution to Pierantonio Mezzastris. It was subsequently detached and lost. Bishop Filippo Trenta commissioned an oval panel from Gaetano Gandolfi in 1789 for the nuns of the Chiesa della SS Trinità in Annunziata, but they rejected it because it was too small for their purposes. The panel, together with a preparatory sketch in oil on canvas, passed to his private collection: the preparatory sketch was recently offered at auction.